Things to Include in the Letter of Application? A letter of application is also known as a cover letter and is majorly a job application document that is sent with the resume. The letter of the application for job provides detailed information about why you are qualified for the job and also your reason for applying. An effective application letter explains the reasons for your interest in the organization and even put forward your skills and interest in a clear and concise manner. The application letter for any position should majorly cover the following three points. Writing tailor applications can not only increase your chances of selection but also help you understand the job and also present yourself well to the potential employer. Even though the resume contains all the necessary information about your profile, yet a cover letter for resume helps to add value to your resume by detailing your capability and highlighting the needed skills for the job. 10+ Cover Letter Templates and Examples. Always Write One- Unless and until the job strictly mentions not to send a letter of application, you should make it a point to send one regardless of being asked or not. And, if the company asks you to send a letter of application, ensure that you follow the directions. Use a Business Format- Use an official Business Letter Format while writing your letter. Include your contact information at the top, the date, and also the employer’s contact information. Make sure you include a salutation at the beginning and the email signature at the end. Establish and Sell Yourself- All throughout the letter, focus on how you would benefit the company. Mention the examples in the form of situations and circumstances where you added value to the company. Adding a numeric value will offer concrete evidence of your skills and accomplishments. Use Keywords- Read and reread the job listing before you draft the letter of application. Focus on the keywords like skills or abilities emphasized in the listing and try and include such keywords in your cover letter. This will help to present you as a strong candidate for the position. KISS Rule- Keep it short and simple. If you exceed the application beyond four paragraphs, there are chances that the application will be overlooked by the reader. Edit and Re-edit- Make sure you edit and proofread the application at least three times before making a final submission. Make sure there are no grammar or spelling errors. List the job you are applying any position for in the subject line of your email. This will help the employer to segregate the important and unimportant emails in his/her inbox. 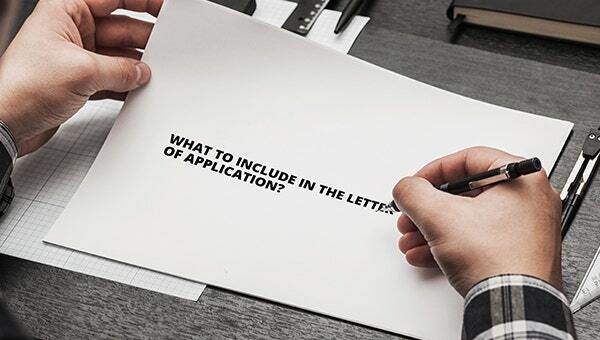 If you are sending the application letter by post make sure to include a heading with your name and address, the date, and the employer’s name and address. If you are sending the letter via email, send it as an attached document with the proper name and job title. In case you are looking for Free Application Letter Templates and Samples, we have them ready for you. It is best to begin the letter by greeting the HR manager or the person in charge with their name instead of a general Dear Mr./Ms. The first paragraph should mention the job you are applying for and from where you found out about the position. Middle paragraph should discuss the skills and experiences along with the reason why you are a good fit for the job. Try and mention an example for every skill or quality mentioned in the application. The last paragraph should conclude the application by thanking the manager for considering you for the role. Don’t forget to mention the contact details for the easy follow-up letters. End the cover letter with a signature in case of a hard copy application letter and just your name for an Email Cover Letter. What Is a Hard Copy Cover Letter? What is Job Application Letter? What is an Email Cover Letter? What Is an Email Job Application Letter?